The holy mountain Amnyemaqen, with an altitude of 6282 meters high above sea level, lies in Qinghai province, neighboring with the north-east region of Tibet. 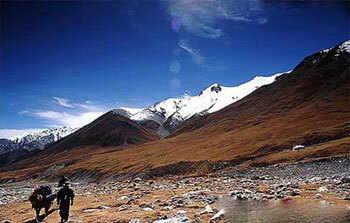 The mountain is covered by the snow all year round and the glacier brooks form the headstreams of the Yellow River. Every year many pilgrims come to the holy mountain to worship and pray for luck and prosperity. Day 02: Lanzhou - Bingling - Xiahe 80+280 km 1N in 2* hotel B/L/D. Today arrive in Peking and then fly to Lanzhou, the capital of Gansu province, is in the middle of loess plateau of China and has long been an important city on the Silk Road in history. The Yellow river flows through the whole Gansu province. Day 02:Lanzhou - Bingling - Xiahe 80+280 km 1N in 2* hotel B/L/D. After the breakfast visit Thousand-Buddha Caves in Bingling (approx. 80 km) over the yellow river by boat. The grottos are firstly built in 420 A.D. and statues here are more older than those in Dunghuang Grottos. In the late afternoon arrival in Xiahe, a city in the south of Gansu province, which is 2,900 meters high above sea level and almost exclusively inhabited by Tibetans. In the morning visit Labrang monastery in Xiahe, the most important religious centre on the northeast border of the Tibet region. The monastery created in 1710, as one of the six grand monasteries in Tibet area, has served for centuries there to connect the Tibetan and Mongolian. In the afternoon drive to Tongren. In the morning visit Longwu monastery of Gelukpa sect which was initially constructed as a monastery of Sakya-sect in Yuan Dynasty (1271-1368) and Wutun village the center of Tibetan Regong-art which is a successful mixture of religious art and folk art. Afterwards go to Tongde. On the way near the village Lajia have a look of the Yellow river. Drive to Sanchakou, the start point of the trekking-trip. Trek the whole Day. the current highest point is 4,565 m.
Trek the whole Day. The current highest point is 4,665 m. above sea level. Trek the whole Day. Arrive in Xiadawu in the late afternoon which is 3.995 m. high above sea level. Trek the whole Day. On the way the highest altitude is 4.485 m. Arrive in Zhejiage late afternoon which is 3.995 m. above sea level. Trek the whole Day. On the way the highest point is 3.685 m. above sea level. Trek the whole Day, the last Day of the trekking trip. In the afternoon arrive in Koko Nor Lake and trek by the lake. Koko Nor, the biggest salty lake in China, with an area of 4,500 square kilometers and an altitude of 3,194 m above sea level. The big lake is acclaimed as "pearl on the highland" and the scenery of which is unusually fascinating and appears different shapes even at the same time. "Koko Nor" in Mongolian language means "blue lake" because of its lunar shape and color. After the breakfast cross over Sun-and-moon mountain (Ri Yue Shan). In 641 Wencheng princess of Tang Dynasty passed by this mountain where toDay a sun-pavilion and a moon-pavilion are built on the summit for people to have a break. The suns and moon mountain has always been an distinguish line between meadow and agriculture area. The Second stop is Kumbum monastery (Ta'er Si) of Gelukpa-sect, which was built in 1560 in Huangzhong county and also one of the six grand monasteries in Tibet. Both Tsongkhapa, the founder of the Lamaistic "yellow hat sect" and the 14th Dalai lama were born here. As Kumbum-monastery has always been playing an important role to connect the Mongolian with the Lamaism, toDay many Mongolian come to this place for worship. Late in the afternoon arrive in Xining, the capital of Qinghai province. This city is mainly inhabited with Tibetan but also a home of Uygur, Kazak and Hui minorities. In the morning transfer to airport for flying to Peking. After arrival transfer to hotel. Remaining time free. To day Transfer to airport and fly to home. End of the tour.